The Tower installed Component of the TUF TUG Safety System. With enough fixtures and climbing cable to install on Towers up to 150 foot in height. For use with a Vertical Fall Arrest Protection System such as the TT-WG-500 made for 3/8 Inch diameter solid core wire cable that automatically travels with User (not included). Each Safety Cable System Kit contains the top and bottom brackets, safety cable and cable restraint brackets appropriate to the height. Body Harness and safety wire grab or clamp are separate options for sale. This Kit supplies for Towers up to 150 feet in Height. Per Rev. G guidelines, any structure greater than 10 ft requires a climber safety device. 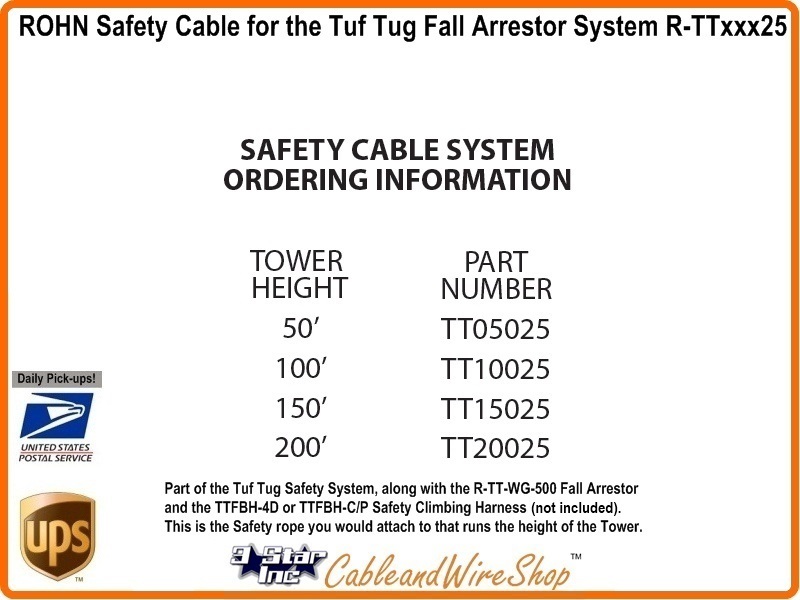 Note: This Tower Climbing Safety Cable System is for up to 150 feet in Height. Other Systems in this Product line reach 50, 100, 150 and 200 feet in height. Trust No Substitutes. Buy ROHN. Buy American.